As the Cosmo League 2nd Division runs into its last few matches of the season, some of the division’s finest direct their attention towards cup games still in the balance while the league goes on. Japan saw 8 past them at Polonia! Japan couldn’t prevent a humiliation by their Polish opponents as they lost 8-1, coming to terms with their final league position. 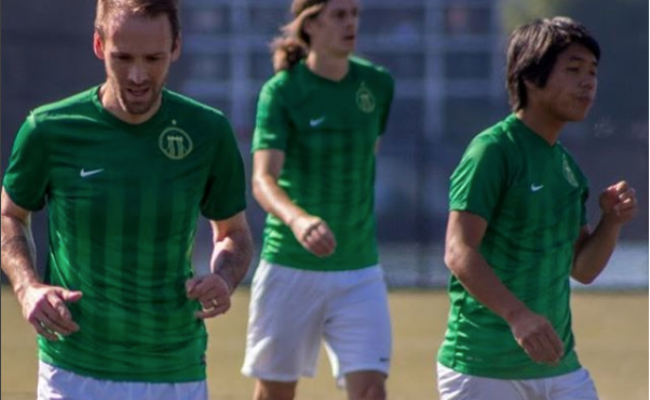 Polonia Gwardia NY looked to keep their strong Southern 2nd place intact as they dispatched an already struggling FC Japan side at Randall’s Island this past Saturday. Head Coach Jakub Grzegorzewski’s Polonia have no doubt looked the part this season and have rightfully merited their place in playoff contention. With a single loss this season (same as 1st place Hoboken who are above them on goal difference), 53 goals scored and allowing 14 goals go past them, they look likely to finish the season on a positive note. Japan will now look for their season to end as fast as they can as they look to improve and build towards these next matches into next season in D2. Allowing an average of 3 goals a game, defense is key to their focus toward late May to notch a win and how to improve and build in the best way. Spring Valley gets the upper hand of Samba AC at Randalls! While not dropping them away from promotion entirely, FC Spring Valley definitely brought KidSuper Samba AC down a few pegs with a 3-1 win last Sunday. Both teams still sit in 1st and 2nd respectively. Both have only allowed 4 losses in 13 or more games. Both have been some of the toughest opposition in the entire Northern Division. Both teams got talented playmakers, goalscorers and defenders galore. More importantly, both teams can cinch top spot and assure promotion to the promised land of Division 1. For 2nd placed Samba AC, the ideal situation is difficult but comes in the form of their next couple of matches being nothing but “W”’s for Player Manager William Cavalry and company. With 26 points compared to Valley’s 31, they need to win their matches against two of the North’s worst teams, Sporting South Bronx and Bronx Supreme FC AND hope for Spring Valley to drop points against Malatyaspor USA, where this will be Spring Valley’s last match of the season. “We have 26 points with one game to play so we just have to focus on taking care of business this Sunday and hope some results go our way.” says Caverly, following the Spring Valley loss. Sporting Astoria SC advances to Saunders Cup semi-final on penalty shootout! Now for a taste of the Div. 2 Reserve sides, Sporting Astoria downs Metro Div. 1’s very own NYC Metro Stars with a thrilling penalty shootout. NYC Metro Stars couldn’t get a goal past D2 Reserve side Sporting Astoria within 120 minutes and vice versa as penalties settled this epic quarter-final. Club Deportivo Iberia had only 10 healthy and available players and had to forfeit to Beyond FC 3-0. “Unfortunately, we were only able to gather 10 players yesterday and only played the reserve game to a 3-3 tie. Goals by Chiki (2) and Javi Beiro…A real shame to have to forfeit the game as we feel terrible for the opposing team that did show up. Central Park Rangers’ cup run ends in heartache! Brishna wins over the Reds 1-0 in the Jack Flamhaft Cup semi-final, where they will face Williamsburg International FC in the cup final. Brishna may be quite a climb away from the top of the league being in 4th place up North but with their name etched into this year’s Flamhaft Cup final, they might have something to celebrate come the end of the season. This 1-0 win over the weekend ends the Reds’ season just as the league comes to a close. Central Park sits in 6th in the Northern Division with a record of 7 wins and 6 losses in 13 matches. It’s quite an ask for the Reds to make it promotion contention with 3 matches left to collect 9 points. And this loss is another unfortunate circumstance in their season. With all of their eggs firmly in the Flamhaft basket, they played valiantly to a Brishna side who just edged over the Manhattan-based club, just wanting it a bit more than the Reds this time around. Bronx Supreme FC couldn’t collect their players and also had to forfeit to Manhattan Celtic in a similar fashion. Kaddo helps book Williamsburg a spot in the Flamhaft Cup final! Williamsburg has won their Flamhaft Cup semi-final against NY Ukrainians 2-1. Williamsburg now see their fate in the cup decided in early June where they are playing in the Jack Flamhaft Cup final against the aforementioned Brishna, thanks to the 2-1 win over the Ukrainians this past Sunday. John Kaddo’s 2 goals over NY Ukranians has given Williamsburg the upper hand this time around and a strong lead going into the final of the Flamhaft Cup. He has also now overtaken goal machine Cory Chaplin of Hoboken FC 1912 in the 2nd Division’s top goalscorers list and now sits #1. A tough loss for NY Ukrainians to stomach, they now will sit in a worse position than last season’s with a current record record of 4 wins, 2 ties and 7 losses, amassing 14 points.